You're probably tired of hearing me talk about all of the wonderful food I've been enjoying since the move. Too bad, because I have to share more. One of my favorite luxuries of living near Atlanta is being able to make occasional trips to the Dekalb Farmers Market. I remember stumbling into this place while I was in college and being completely blown away. The name is misleading because it's not your typical farmers' market, it's more of a store... but unlike any store I've ever seen. It does have tons of produce, some local, some not so much (at least everything is very clearly identified). But my favorite two sections are the grains and spices. They buy everything in bulk and then package it themselves, so their spices are incredibly cheap (some less than 10% of what you would pay in a typical store). And they have every grain I've ever heard of (including sorghum, not that I have any desire to buy any). The meat, seafood, and cheese sections are amazing, too, but I'm usually too cold to stay long once I get to those sections (I'm pretty sure they keep the store at around 50 degrees, and I can never remember to bring extra clothes). Every time I go to this place, I leave with a huge smile on my face. Not only is it a fun shopping experience, but it's so cheap (but incredible quality) that I always feel like I've won something. Notice the plethora of grains (in the tall, stacked containers and the bags in front) and spices (the short containers). 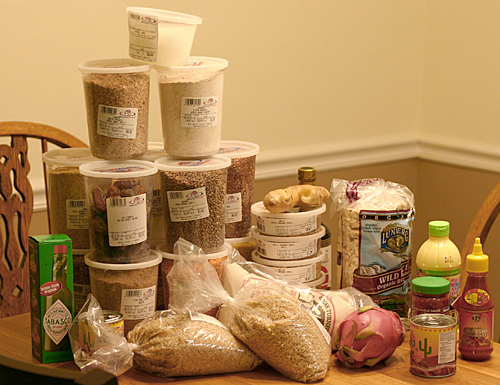 I tried to control myself because I went two days before I left for Toronto, so I couldn't buy many perishable foods. My favorite part about the produce section is that I've never heard of about a quarter of the items they sell. It's the perfect place to find strange ingredients for recipes, but I'm also excited about trying something new each time I go. 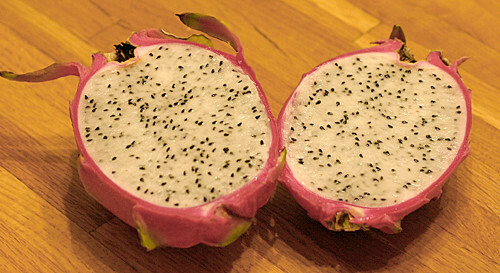 This time I didn't go too crazy, but I decided that I needed to finally eat a dragon fruit. The descriptive sign above them went into detail about their laxative effects, so I was a bit hesitant about eating it the night before my trip, but I was brave and suffered no consequences. I really enjoyed it, and was excited to see some at the opening reception at my conference a mere two days later. Plus I have more blueberries, but I forgot to take a photo. 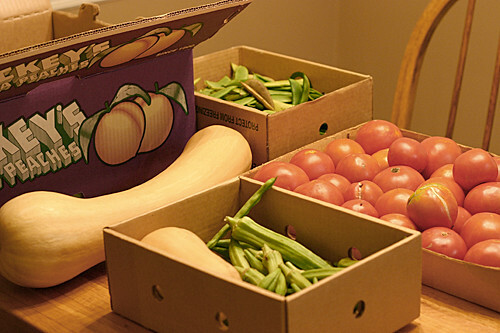 How can you be sad when your dining room table is filled with amazing produce? 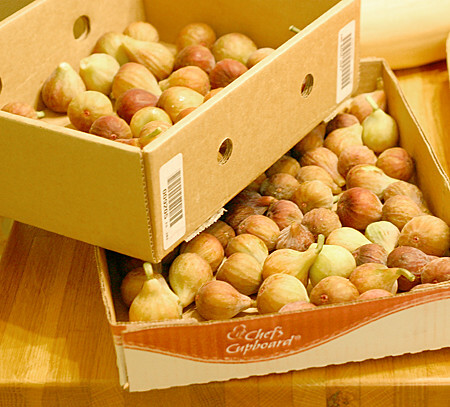 I going to experiment with drying some of the figs in my oven this weekend - does anybody have any tips? And to top it all off, I had the experience of my life the other day. Every year my grandparents would take a field trip to Dickey Farms in Musella, GA. After hearing tons about this place, I convinced one of my friends that we should venture out there, and now I completely understand why they love Dickey Farms. It's not a huge operation, but I was mesmerized by the washing/sorting/packing machines. If you go in the middle of the day, you will find dozens of retired people sitting on the porch in rockers eating peach ice cream. And if you go out back, little old ladies are frantically piling the "reject" peaches into 1/2 bushel boxes. While we were there, a church van pulled up with tons of excited ladies, and I can only imagine the pies and cobblers that they made when they got home. We happily joined in to fill our box for only $5. Yes, you read that right. Five dollars. And we had well over 30 pounds of peaches in our box. The entire process was fun - I was trying to catch the peaches as they flew off the conveyor belt (but felt like Lucy in the chocolate factory). 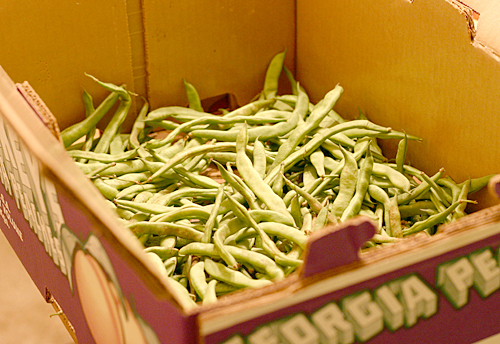 Many of the "rejects" had a soft spot, but plenty were fine - just too ripe to ship to stores. We split the box, but I was still exhausted after freezing my half. A big part of me wants to go back next week, but I'm not sure what I would do with more peaches. Somehow between shelling beans and going to the peach farm, I've been able to get a lot of work done in preparation for my fall classes, but that's less fun to talk about :). Have any of you had an exciting food adventure recently? 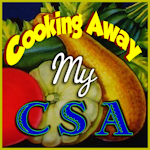 Just after getting my cooking mojo back last week, I headed to Toronto for a conference. Toronto is a great place to eat because you can find authentic food from all around the world within a few blocks (I ate at Thai, Vietnamese, Mexican, and Greek restaurants all right around my hotel). After recovering from the trip (lots of science + lots of late nights catching up with friends = a very tiring week), I was finally ready to do some cooking last night. I was in the mood for chicken, and decided that I should finally make the Trinidadian chicken curry I noticed on The Pioneer Woman a while back. I've been extraordinarily happy with every one of Ree's recipes that I've tried (especially the peppers and mushrooms I made for Mom's birthday party last month), so I had faith that this wouldn't disappoint me. I was correct. As soon as I smelled the marinade, I knew this would be delicious, and it only got better from there. This dish has bold flavors, and I never would have thought of the combination of mustard, pico de gallo mixture, and curry powder. This will definitely become one of my staple dishes, especially when I'm cooking for meat lovers (Dad, this means you). Sprinkle the chicken with salt, and rub it with the mustard. Combine the tomato, half of the onion, cilantro, garlic, and black pepper in a food processor and pulse a few times until the veggies are very finely diced. 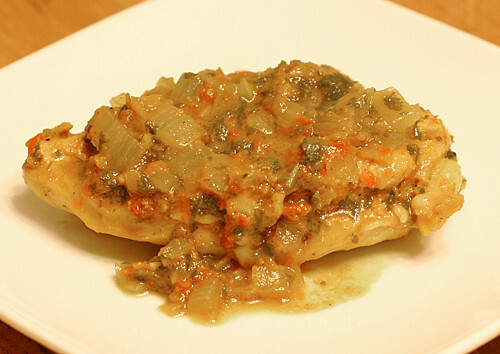 Pour this mixture on top of the chicken, mix well, and let the chicken marinate for at least 2 hours. When you're ready to cook the chicken, mix the curry powder, turmeric, and water together in a small bowl. Heat the oil over medium heat in a large saute pan, and then stir in this spice/water mixture. Continue stirring until the sauce thickens and turns darker (about 10 min). Then dice the other half of the onion, and saute it in the sauce until tender (about 5 min). Next, add in the chicken and all of the veggie marinade, loosely cover the pan, and cook for 5 min. Stir everything around in the pan, cover, and continue to cook for 20-25 min, stirring occasionally, until the chicken is done and the sauce is thick (you can remove the cover for a few minutes if the chicken is done before the sauce thickens). Serves 4. I moved to Georgia at the perfect time. Ok, so it's not the best time to be moving stuff (my shirt was visibly soaked with sweat all day Monday after hauling boxes of books into my new office), but as soon as I got here I was inundated with delicious produce. When I left Michigan I was still eating asparagus, greens, and strawberries, but as soon as I got to Georgia I dove head first into peach season. And I can't forget about the cantaloupe, tomatoes, okra, corn, figs, blueberries, watermelon, peas, and squash. I also love that I can now enjoy the fruits (and vegetables) of my grandmother/uncle's garden. Mom has been making the trek to grandmother's house (over the river and through the woods) every other weekend, and lucky for me, I'm right on her way home. In addition to the blueberries and figs, Mom brought me cucumbers, tomatoes, and okra last weekend. She also handed me the most recent issue of Southern Living that features recipes with tomatoes, okra, and corn. The cover features a bowl of maque choux with sausage, and it looked good enough to try. I've made maque choux before, and I have to say that I think I liked the other version better for one simple reason. The bacon is essential. The sausage is great, but it doesn't permeate the vegetables like bacon does. So if you make this, please cook the vegetables in bacon grease and then crumble the bacon on top at the end (and maybe use a little less sausage than I did). One slice will do, and it will make all the difference. Or, if you want to stick with this recipe, use amazing sausage (something like the medium or hot sausage from Bradley's Country Store in Tallahassee). I'm not saying this wasn't good as is (it's hard to go wrong with fresh homegrown veggies), and I'm still enjoying the leftovers, but I learned an important lesson. Brown sausage pieces in a large skillet over medium-high heat. Then stir in the onion, green pepper, and garlic and saute until tender (about 5 min). 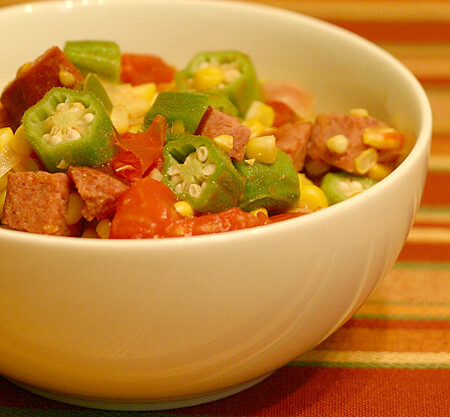 Add okra, corn, and tomatoes, reduce heat to medium-low, and cook for about 10 min, stirring frequently. Season with salt and pepper to taste. Serves 4. I've been in Georgia for about 2 weeks now, and I finally feel settled. The movers delivered my stuff yesterday (I found out the hard way that sleeping on an air mattress for that long is NOT pleasant), and before that I barely did any cooking. I had a pot, pan, cutting board, and knife with me, but I couldn't get inspired to cook something that I would have to eat off of a paper plate with plastic utensils. I did make spaghetti and a couple of decent stir-fries, but nothing was worth writing about. But now that my kitchen cabinets are full and I've rested from yesterday's marathon unpacking session, I finally feel ready to cook again. While I was still recovering today, I decided to make a smoothie. I was drinking smoothies almost every day before I left Michigan, and I'm very excited to be reunited with my blender. It was also perfect timing because today I got blueberries and figs from my grandmother's garden. I don't typically think of blueberries and figs as a good match, and I was planning to make a blueberry and peach smoothie, but I decided to give my body a brief break from peaches (I've been eating about 5 a day) and try this weird combo. To my surprise, I really liked the flavor. 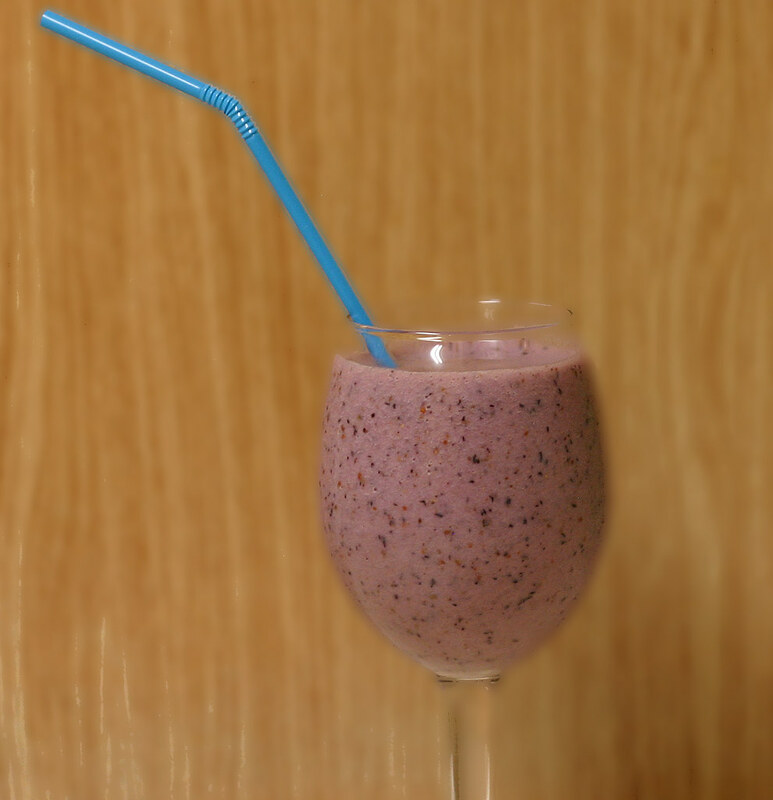 It was more subtle than the smoothies I usually make (I might try adding more fruit, especially blueberries, next time), but was incredibly good. I usually use yogurt in my smoothies, but I didn't have any and substituted milk. One of the primary reasons I love smoothies is that you can practically throw anything into a blender and it turns out great, and this was the perfect example. Add all ingredients to the blender, and blend on high until the ice is all pulverized. Serves 1-2.